This is probably the easiest and tastiest appetizer recipe you will ever find. I mean what is better than bacon + cocktail smokies + and dark brown sugar?! The only thing better of course is that it's super simple to make. I've made this appetizer for numerous parties. Let's just say it won me a few cooking contests back in college and won over many frat boys back in my day. I've also made it for quite a few football parties and events since then. The one thing people say every single time they try one, aside from wondering how many calories are in each one, is "how can I make these? I need the recipe!" So that everyone can partake in these delicious caramelized creations, I decided to share the recipe with you all just in time for Super Bowl Sunday. Take the entire package of bacon and cut the slices into thirds. 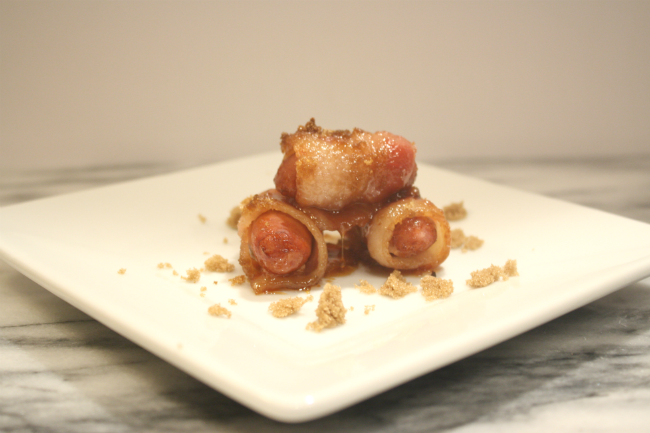 Take 1/3 of a slice of bacon and wrap around a cocktail wienie. Place on a baking sheet that's covered in nonstick aluminum foil. Continue till all wienies are covered with bacon. Heavily coat the wienies with dark brown sugar. Using dark brown sugar is key to getting the caramelizing effect. Bake at 375 degrees for 30 minutes or till the bacon is thoroughly cooked. Serve immediately. This appetizer is perfect for any party and will make a great impression on all your guests. I plan on making these for Super Bowl Sunday! A few things to note... make sure you serve immediately after they are cooked and cooled. They can harden pretty quick. Also, make sure you soak and clean any plates very soon after use. The sugar can harden quickly and not be the easiest to get off a glass plate or baking sheet. Girl, you know how much I love these! I will definitely be making some this weekend. I used half my package of bacon and made these yesterday, and used the other half package of bacon and made glazed bacon and both were super yummy! YAY!! SO glad you gave them a try and loved them!! It's definitely one of my favorite recipes to make.